David Hurd has been teaching about the wonders of science for over 26 years. Dr. Hurd is currently Professor of Geosciences and Planetarium Director at Edinboro University of Pennsylvania and holds a B.S. in Geology from Iowa State University, an M.S. in Science Education from University of Nebraska and a Ph.D. from Cleveland State University. His broad science background coupled with his high energy and inquiry based pedagogy is stamped on his teaching techniques and Hurd consistently is nominated and has received the honor as educator of the year at his university. 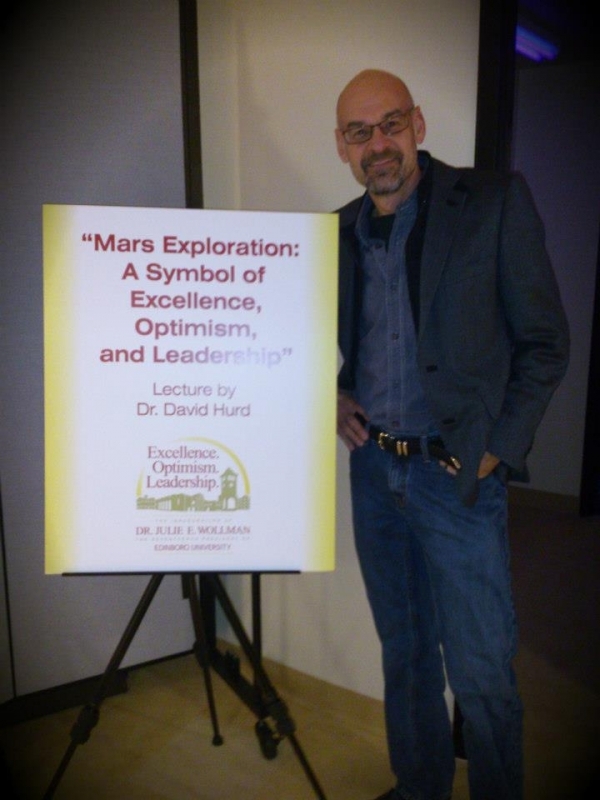 In addition to Hurd’s innovative work in the classroom, he also provides interactive and live planetarium programs for thousands of K-12 and general public participants annually and is nationally recognized in the planetarium community for his inclusion of ALL learners in STEM initiatives. Over the past 14 years, he has produced and implemented tactile astronomy materials for those who are blind, and presented workshops on teaching astronomy to students with visual impairments. Working directly with College of Charleston professor, Dr. Cass Runyon, Hurd has produced products for NASA that help bridge the gap between the research community and special needs students; including “Tactile Guide to the Solar System: with digital talking text,” and other astronomy tactiles. Recently, Dr. Hurd served as co-principle investigator on a major Department of Education grant that taught science teachers how to better address the needs of students with visual impairments. Most recently, with support from NASA’s Lunar Science Institute, Hurd authored and directed the production of a primer on lunar cratering entitled “Getting a Feel for Lunar Craters” which features custom made tactiles of major crater types found on the moon and descriptive text in accessible PDF and a digitally mastered recording of the text. This book, along with the many other science tactiles that Hurd has had a part in producing will continue to inspire ALL learners to learn more about the wonders of our universe. Hurd has also been invited by NASA to serve in eductation and public outreach initiatives for missions such as GRAIL, Phoenix and Mars Science Laboratory. Dr. Hurd works at Edinboro University of Pennsylvania which is nationally recognized for its for its service to students with disabilities. This is an honor he does not take lightly or for granted and Dr. Hurd continues to push for expanded experiences for all students to highlight STEM interests and careers. In addition to his professional endeavors, David Hurd also shares a personal connection to those with disabilities. Two of his four sons have significant disabilities. This has helped shape his passion and desire to see expanded opportunities in learning about science.